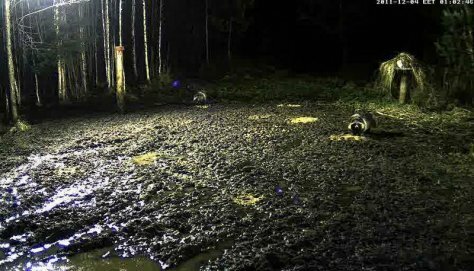 Two raccoon dogs were equipped with telemetric monitoring devices a few days ago; it seems that the collars went to a raccoon dog pair. When they turn their heads the white collar bands show and both were at the feeding ground before eight o’clock. The aim of the study is to find out how they choose their habitat around the feeding ground and their winter movement activity, also the impact of raccoon dogs on ground nesting birds, including protected species such as the capercaillie.